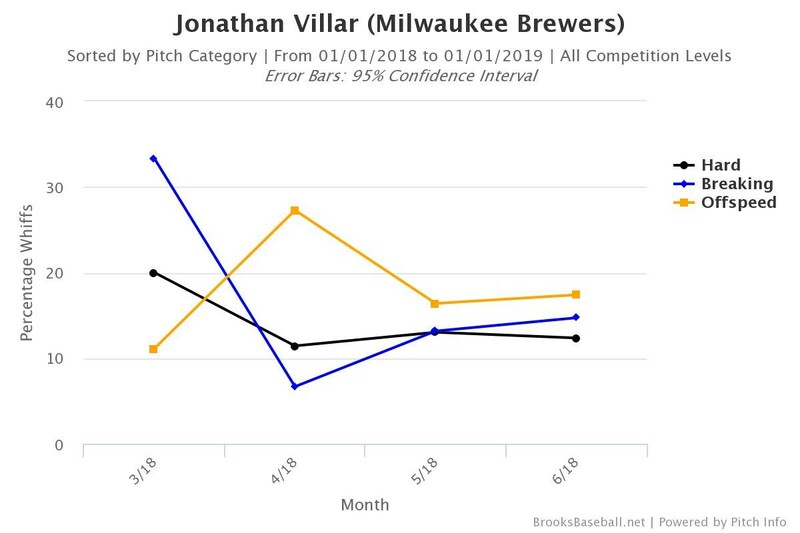 Jonathan Villar has had a weird season. For the first month, the stats on television graphics made him look like he was playing pretty well. He hit .271 in April, which is fine for a second baseman who the Brewers couldn’t have been sure would do even that much. 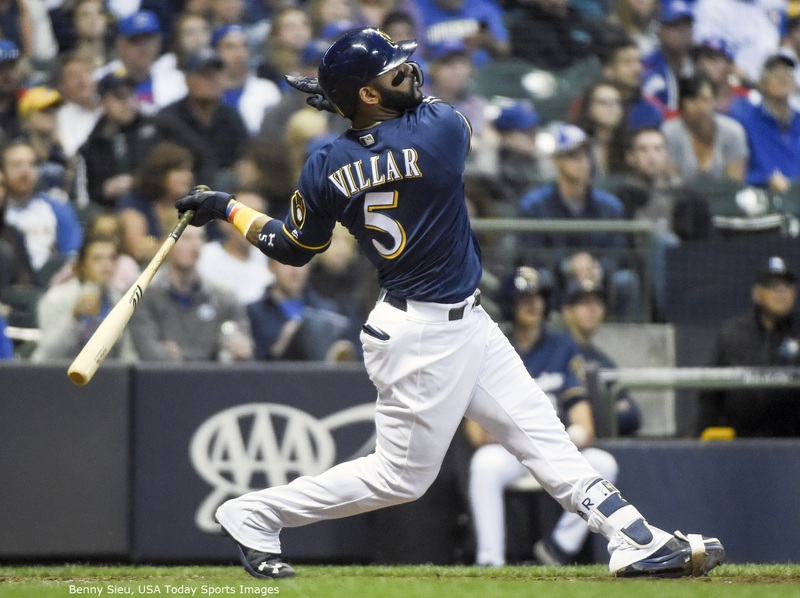 But it was an empty batting average, as Villar had only two extra base hits in the entire month, and he walked just five times. 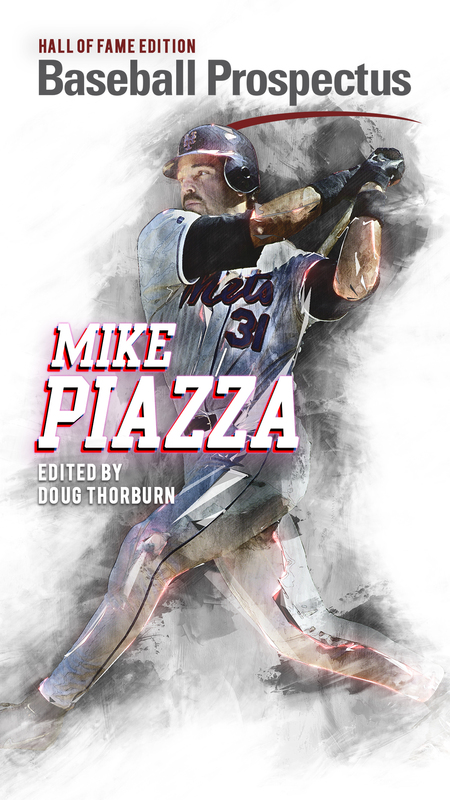 As a result, his .271 batting average generated only a .629 On-Base Percentage plus Slugging Percentage (OPS). 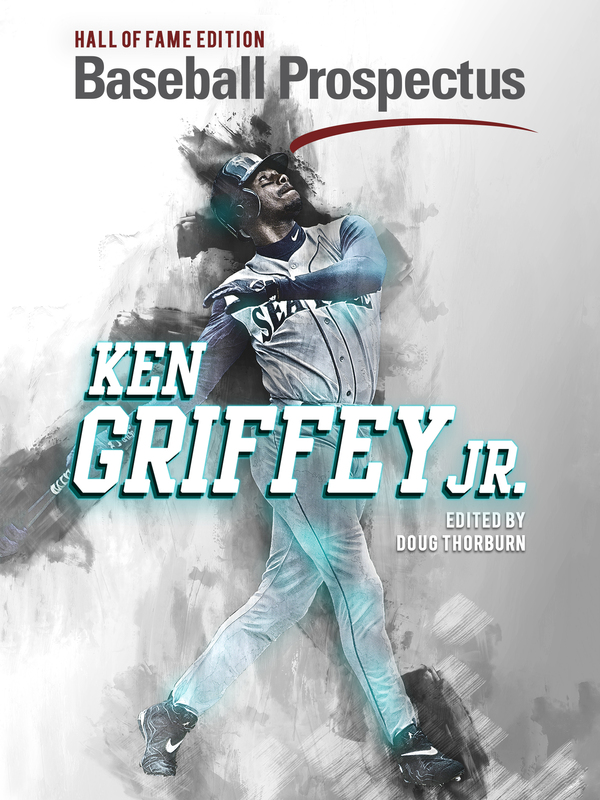 In May, his batting average stayed basically the same (.275), but he added the power that had been missing from his game. In Villar’s fantastic 2016 season, the middle infielder slugged .457, which was far above his career levels. Last year, that number dropped all the way to .372, so the fact that his May slugging percentage (SLG) was .449 was encouraging. That jump in power resulted in a .787 OPS in May. June’s numbers look poor on the surface. Villar is hitting just .230 this month, and his SLG is .410; while it is certainly an improvement from his bad season last year, it is not quite at the levels at which he is most successful. His OPS this month is .675, which feels about right: Villar has not been as bad as he was in April, but he’s been worse than he was in May. However, there are signs that the second baseman has in fact turned his season around. Villar’s June batting average on balls in play (BABIP) is .289, which is far below his career .345 mark. BABIP fluctuates within a season, but a player’s career number generally represents what one can expect their true BABIP talent to be. So even though .345 would normally be considered abnormally high, Villar may actual be able to produce that number consistently. In fact, his overall season BABIP this year is .360. Thus, the fact that his batting average dropped in June can be attributed at least in part to his lower BABIP. Villar’s swing-and-miss numbers also haven’t changed, which indicates that he is making about the same amount of contact but the ball just isn’t falling. This suggests that the lower BABIP is in fact the cause of his worse June performance. Further proof that Villar is in fact hitting better is that his isolated slugging percentage (ISO) in June is higher than it was in May. SLG is partially dependent on batting average, but ISO removes batting average, and all of its associated BABIP vagaries, and just demonstrates how many of Villar’s hits have been for extra bases. In April, when his batting average was astoundingly empty, Villar’s ISO was .047; in May and June, it has been .174 and .180. He is in fact driving the ball better, and that is making him a productive hitter. Villar’s value on the field is tied to his power at this point in his career. Fielding Runs Above Average (FRAA) has never considered him a great defender, even at his mark of 4.6 FRAA in 87 games in 2014. Thus Villar’s value has been driven by his bat. And he walks some, with a career 8.8 percent walk rate that is above the major league average of 8 percent, but his career .256 batting average isn’t particularly great either. For him to be a valuable offensive player, he has to hit for power. This season, Villar’s.126 ISO is still below MLB’s league average for second basemen of .141. His batting average (.260) and OBP (.307), however, are right around the league marks (.248 and .309, respectively). And yet, Villar has been a below-average hitter, as he has thus far posted a .255 True Average (TAv), and his negative defensive value has made him a replacement-level player in 2018. Shockingly, this is in fact worse than he was last year when he posted 0.8 WARP (although his negative value this year is due to defense, and partial-season defensive metrics are more unreliable than their offensive counterparts). What this has generally demonstrated, however, is that Villar needs to hit for power to be valuable. He has begun to do that, though. His April was quite bad in this respect, so his season-long numbers are still unimpressive. But in the last seven weeks or so, he is now hitting for power. If that continues, he may be serviceable at second base so that the club can survive with him in the lineup if a replacement does not arrive via trade.